Over the weekend I made it my business to re-watch the last few episodes of Scandal season 3, to gear up for season 4 and the return of #ShondaThursdays. Yes, Shonda Rhimes is about to make history again when she premieres this Thursday on ABC three back-to-back television dramas. The lineup starts with Grey's Anatomy at 8pm, Scandal at 9pm and the latest series starring Viola Davis, How to Get Away with Murder at 10pm. 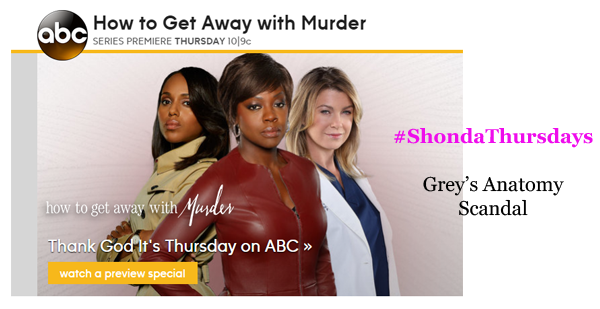 ABC is better known as Shondaland, and with ABC's entire Thursday prime-time real estate belonging to Rhimes, others are saying Thursday should be renamed "Shonday." Can you imagine what the rates for those advertising slots are? When Shonda Rhimes writes her autobiography, it should be called 'How Get Away With Being an Angry Black Woman.' On Thursday, Ms. Rhimes will introduce How to Get Away With Murder, yet another network series from her production company to showcase a powerful, intimidating Black woman. The Shonda Rhimes cast (which includes more than 30 stars and producers) along with readers and commentators are protesting the Times story, calling it out of touch. And surely it is, as everyone is gearing up for Shonday. Check out the promo video and see how ABC is promoting their Fall Thursday night lineup. Are you ready for Shondays? Share your thoughts.